Which is better: dishwasher or washing dishes by hand? Anyone who’s ever watched a teenager (grudgingly) wash one fork at a time when it’s their turn to do the dinner dishes has probably had the thought “I wonder if that’s really the most efficient use of our resources.” Actually, your first thought is probably, “How does the child manage to run the hot water continuously yet get the task done at such a glacial pace?” (Don't Miss: How to Save Time in the Kitchen: Our Best Time-Saving Ingredients & Cooking Tips) In any case, your suspicions that it’s really not the best thing for the environment are borne out by research. By comparison, an energy-efficient dishwasher uses about 4 gallons of water and 1 kWh of energy per load. (And over the course of a year, using the dishwasher saves more than 400 hours of labor!) Researchers also found that dishwashers cleaned better, as half of the hand-washers failed to reach an “acceptable level” of cleanliness. As far as we know, the researchers shed no light on how to get your family to load the dishwasher properly, start it when it’s full and then put the clean dishes away without complaining about it. 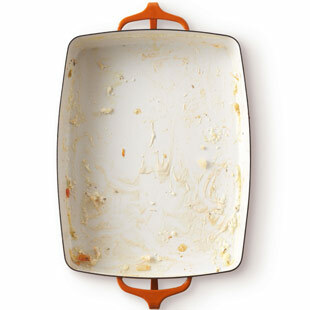 • Scrape food off plates before loading the dishwasher, but don’t pre-rinse. • No dishwasher? Hand-wash dishes right away (you’ll use less water when there’s no stuck-on crud).